Haitian Protester Was Killed by Bullet, Not "Blunt Object" As UN Claimed, "Mostly Rubber"
UNITED NATIONS, July 2 -- While the UN congratulates itself for naming Bill Clinton as envoy to Haiti, questions are multiplying about the June 18 death of a civilian mourner in a crowd policed by the UN in Port au Prince. On June 19, UN Spokesperson Michele Montas said that the demonstrator, who remains unidentified but was among 2000 marching with the casket of Rev. Gerard Jean-Juste, was killed not by a bullet but by a "blunt object." In June 22, Inner City Press asked Ms. Montas if the UN peacekeepers policing the crowd has fired rubber bullets or live ammunition. Ms. Montas never answered the question, but instead insisted that "the demonstrator was not killed with a gun." Now it emerges from the autopsy that the demonstrator was killed by a bullet. In Haiti, the UN has acknowledged this finding to the local press corps, and that its peacekeepers used live ammunition. But nothing was said by the UN in New York, to amend its previous statements. On July 2, Inner City Press asked Ms. Montas about her statement that the demonstrator was killed by a blunt object. "MINUSTAH has said that, true," Ms.Montas replied, referring to the UN mission in Haiti by its French acronym. She then said, contrary to her UN counterpart in Haiti, that the autopsy was not yet out. When Inner City Press repeated its unanswered June 22 question about live ammunition, Ms Montas said "I didn't get an answer, I gather they are rubber bullets, mostly." Video here, from Minute 13:03. It seems to some that the UN Spokesperson should update claims she has made once they are contradicted in the public record -- particularly by local UN offices. We aim to have more on this. 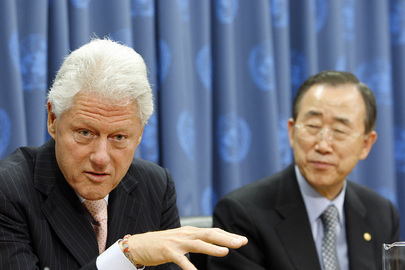 UNITED NATIONS, June 15 -- The depths of Haiti's problems emerged at Bill Clinton's UN press conference on Monday. After Clinton spoke of the need to make a registry of non-governmental organizations to better coordinate their work, Inner City Press asked about the lack of registration of the children that are born, particularly in rural Haiti. Video here, from Minute 29:12 to 33:59. During the Security Council's recent trip to Haiti, a representative of UNICEF told them that the lack of registration leads to illegal adoptions and even the sale of babies for organs, one Permanent Representative told Inner City Press, urging that this too be asked of Clinton. 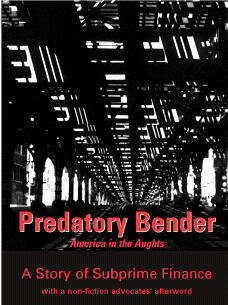 He was responding to Inner City Press' June 12 question, at a briefing on child labor, about Haiti's restavek system. 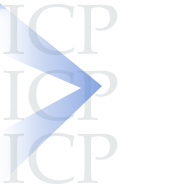 After Clinton's opening statement, Inner City Press asked about restavek, registration and the UN's failure to disclose any discipline meted out to the more than 100 peacekeepers repatriated to Sri Lanka after being accused of sexual abuse and exploitation. 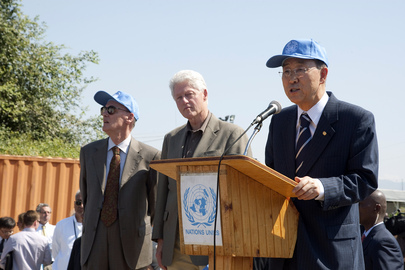 On punishment for sexual impropriety, Clinton said he would not answer, that Secretary General Ban Ki-moon would. But on restavek, he said he knew well of the problem. He said, parents were promised their children would be educated in exchange for work, but the schooling never happened. Some restavek victims are in the United States, he said. He will try to work on the problem. On sexual abuse, Mr. Ban said the UN has received assurances that some discipline took place after repatriation. But the UN has never said what this was. Inner City Press asked Haitian Foreign Minister Alrich Nicolas, also present, but he did not know, either. How can the UN claim a zero tolerance policy when it won't report this basic information? We will continue on this. 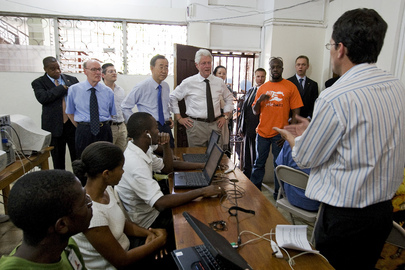 Inner City Press: President Clinton, you had mentioned the registration of NGOs in Haiti. But there are parts of the country where babies' births are not being registered. We are told this leads to illegal adoptions, something called the restavek system of forced labour and even of trade in organs. This is something that one of the Ambassadors on the recent Security Council trip there raised. I am wondering, what, as part of your work, you can do? And also on the theme of, first do no harm, recently more than 100 Sri Lankan peacekeepers were repatriated from Haiti under charges of sexual abuse and exploitation. Thus far, the UN hasn't announced what happened to them once they got back to [Sri Lanka], whether any discipline was imposed. Do you think the UN should release that kind of information, and what do you think of that? Will part of your job involve making the UN either more transparent or more accountable, including to the people in Haiti? Special Envoy Clinton: Well, first, I think the Secretary-General should answer the question about the peacekeepers. But I will answer the other questions. The restavek system is one of several kinds of mechanisms around the world where desperately poor people earn money by, in effect, by putting their children in conditions of involuntary servitude of all kinds. In Haiti, much of it was originally pitched as “I'll send your kid to school if your child will work in my home”, but as we all know, more often than not, it doesn't work out that way. I believe the most important thing that we can do is to raise the economic conditions in those areas, increase the reporting and the accountability, and then encourage the Haitian Government to take appropriate legal action. But, I am sad to say, we have even had the example of restavek children being found in the United States, in Haitian communities. And so, yes, it's one of those things I know about. I care a lot about it. I am going to do what I can to create the conditions in which we can bring an end to it, and the other abuses that you mention. But, I think it is important for those of us who have never been there. Keep in mind that this country is close to the United States. It is in our hemisphere. It is a Caribbean country. But its per capita income is quite low. Probably one of the 35 lowest in the world, and in the rural areas, even though it is not a large country comparatively, there are almost no systems of the kind that you and I take for granted, even in other relatively low income Central American countries to stop these kinds of things from happening. So, we have go to build out these systems, and I am very aware of all this. I will do what I can to help end it. But I assure you, most Haitians would like to end it too. We just have to give them the power to do so. I can't comment on the Sri Lankan soldiers; I don't know, maybe? SG: On the second portion of your question, it is a consistent policy of the United Nations, when those soldiers commit crimes, they are repatriated to their own homes. We demand the national authorities of the countries concerned to take administrative and judiciary punishment, procedures, corresponding to the seriousness of the crimes. This is exactly what we did in the case of the Sri Lankan peacekeepers. I understand that they have taken the necessary domestic measures. 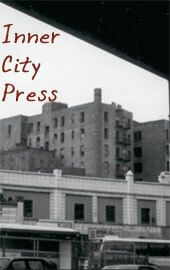 Inner City Press: [Maybe] the Government of Haiti was told what happened with the peacekeepers that were repatriated. Because I know that here it was never said how many were convicted, or what discipline was imposed. Foreign Minister Nicolas: It is the Minister of Justice and the Minister of Planification and Cooperation are working on that.